1. Trump vs. The Fed: Investors are still considering the implications of President Donald Trump's unusual criticism of the Federal Reserve. Trump told CNBC on Thursday that he's "not thrilled" with the Fed for raising interest rates. The comments mark a break from the presidential tradition of avoiding criticism of the Fed, which is designed to be independent from politics. Trump said he's worried that the central bank's policies will cancel out his efforts to speed up the economy, even though he appointed the head of the Fed, Jerome Powell. "I don't like all of this work that we're putting into the economy and then I see rates going up," Trump said. 2. Earnings: General Electric (GE), Baker Hughes (BHGE), Honeywell (HON) and SunTrust Banks (STI) will release earnings before the open. Wall Street has been loving GE's decision to break itself apart. But bold steps to further shrink GE's empire mean that the company will be even more exposed to trouble in its biggest problem areas: power and banking. 3. Stock market movers -- Microsoft; Skechers: Shares in Microsoft are set to push forward 4% at the open after the company reported strong earnings on Thursday. Microsoft (MSFT) posted $110 billion in sales for the fiscal year ending in June, a 14% increase over the prior year. CEO Satya Nadella credited "early investments" in cloud services for the results. Microsoft has shaken up internal operations to prioritize the cloud and demote its legacy business, Windows. The shift placed Microsoft near the front of rapidly growing technology segment after years of struggling to compete in smartphones and online services like search. Shares in Skechers (SKX) were being crushed premarket after the footwear company reported a 24% drop in quarterly earnings. The stock is down by about 25% ahead of the open. 4. Pharma focus: Investors will be watching Big Pharma after Merck (MKGAF) joined Novartis (NVS) and Pfizer (PFE) in pledging to limit drug price increases in the United States. Merck said it's cutting the price of Zepatier, a drug that treats Hepatitis C, by 60%, and reducing the price of six other medications by 10%. The company also said it will not raise the average price of the drugs it sells beyond the annual rate of inflation in the United States and will continue to "evaluate our portfolio to look for opportunities to further reduce costs." The move by Merck comes after Pfizer announced price hikes for nearly three dozen drugs only to reverse course amid public pressure from President Donald Trump. 5. 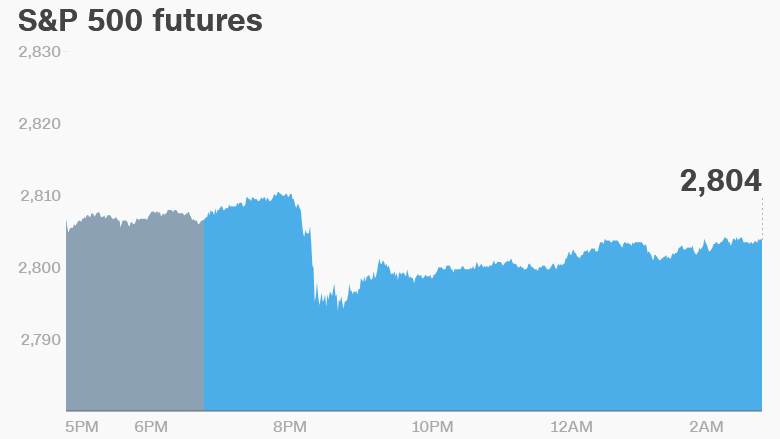 Global market overview: US stock futures were mixed on Friday after key indexes dipped during the previous trading session. European markets were little changed. Most Asian markets ended the day with gains. The Shanghai Composite jumped up 2%.